People who come to work at West Bend find more than rewarding careers. They find an incredible working environment with vistas of natural prairie and woodland, continuing education courses to enhance their skills and knowledge, a cafeteria that serves a tasty breakfast and lunch, a well-equipped fitness center with an array of fitness courses, and an on-site convenience store, bank, ATM, and dry cleaning service. But best of all, they find friendly, warm, and enthusiastic associates who often quickly become their friends. Finding your place at West Bend is about more than finding a job. It's about being where you want to be. Learn more about our current openings and apply directly by selecting the ‘Our Career Opportunties’ button below. We are a smoke-free, equal opportunity employer. Pre-employment drug screen and background verifications are required. West Bend will provide reasonable accommodations with the application process upon your request as required to comply with applicable laws. If you have a disability and require assistance in this application process, please call 1-800-236-5010, extension 6584, or e-mail hremp@wbmi.com. 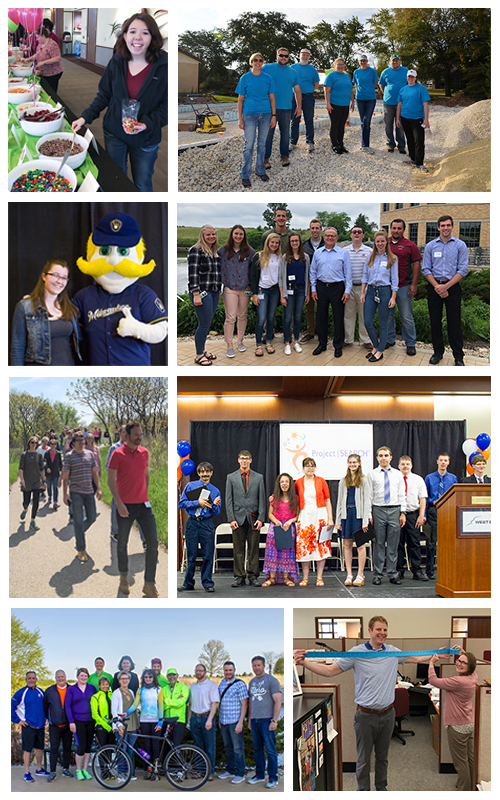 West Bend attended several career fairs during the 2019 spring semester, including Madison, Whitewater, Milwaukee, and Oshkosh. Stay tuned for a list of fall fairs we'll be attending!